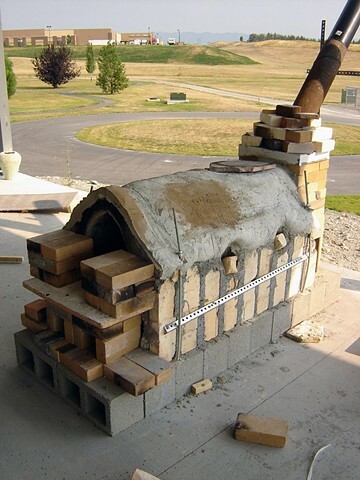 The summer session of the FVCC Ceramics Sculpture class wanted a wood kiln that would allow the students to experiment with salt and soda....but we didn't have very much money. So with what cash we had (around $150) we ordered a few bags of refractory cement. Then we pulverized a zillion old broken soft bricks, constructed a catenary arch form with cardboard, re-bar and chicken wire, and put together what we liked to call "Mini-me-agama." The first few firings did not reach temperature, but eventually the students learned how to fire the kiln, and consistently hit cone 10-11 in less than 10 hours.